How does the weight of matter change when it is combined? Mix up some gingerbread to explore. Begin by observing an anchoring phenomenon: ice melting and a snowflake forming. 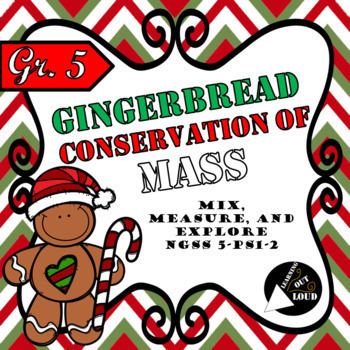 Students will then investigate matter, mass, mixtures vs. solutions, physical and chemical changes by mixing together separate ingredients to make gingerbread. 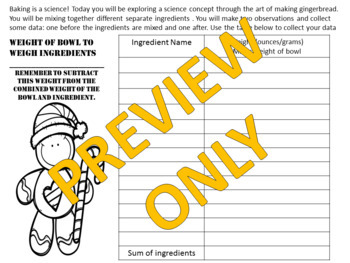 As a class, they will weigh each ingredient individually and find the total sum weight of the ingredients. Then, after combining the ingredients into a mixture, they will find the weight again and compare the two. They will observe that no weight was lost or gained in the process of mixing. 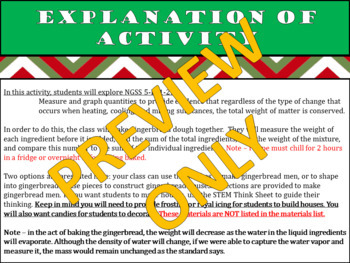 Then, you can either have them bake up some tasty gingerbread men, or take it step further to incorporate the engineering and design principles. Students will be tasked with designing a roof that causes the least amount of snow to accumulate. 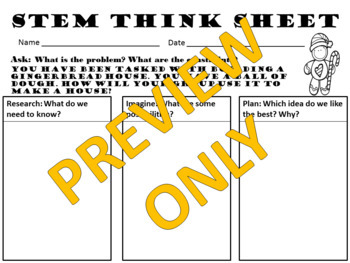 They will work through the engineering and design process using a STEM Think Sheet and test their designs.